I'm 26, currently in the process of trying to go back to college. Very fun and outgoing, love to be outside being active. 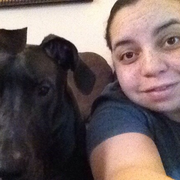 I have a two year old Great Dane, I've had him since he was 3 months old. I'm not sure what I would do without him! He's such a a character, we live in a apartment so we're always going on long walks and to the dog park. I use to work at Starbucks on 30A and I would dog sit for a few of my regular customers when they were out of town. I've dog sat three times at my own place and over 10 at the owners house. I have my own transportation, if need be I can travel to the owners house multiple times a day, stay overnight, or the pet can stay with me. There's fenced in dog park right around the corner from my apartment and Psy my Great Dane is very loving, loves to play, and be around animals, even cats!! He's more scared of them than they are of him :) I've had pets since I was 2 mainly dogs and love them.